Life is unpredictable, so it really does serve you well to "hope for the best but prepare for the worst". Natural disasters, accidents and death happen every day. Each of these carries a great deal of emotion with them. That emotion can be overwhelming at the time and may even cloud judgment. In addition, an "emergency" could also signal something like the loss of your job, a premature birth, an illness, identity theft, etc. That's why it's imperative to get organized now so if the unexpected occurs, you're ready and able to deal with all of the day-to-day small things that really do make a big impact. Like your first-aid kit, we've developed for you an emergency financial plan to keep handy with you at all times and to update when life throws you a curve ball. It never hurts to stash a little extra cash. Set up a specific savings account titled "Emergency Fund" or designate a certificate of deposit or money market as your "Last Resort Fund". Whatever method you choose, be sure to have some extra money on hand. Most financial experts recommend having at least three months of your salary in reserve at all times. This estimate matches most employers' severance packages and should buy you some time as you figure out your next move. Tap into this fund only if you lose your job, have damage to your home, incur medical or hospital expenses not covered by your insurance or wreck your vehicle. 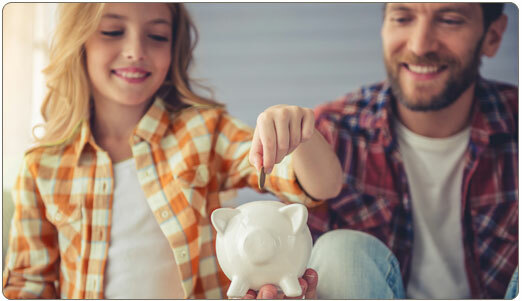 Hopefully if your loved ones are as prepared as you, you won't need this money to cover a death or a loved one's left-behind debt - but again, it never hurts to be prepared. Cool Hookup: Click here to view a "Family Disaster Plan" developed by the Federal Emergency Management Agency and the American Red Cross. It offers four steps to safety, creates a disaster plan and provides a checklist of "to-dos" for you and your family to practice. There are some things you have no control over, but then there are those that you do. Make sure you and your loved ones are taken care of in case of an accident or death. There are resources available to you to insure you don't leave others with your debt or are left yourself with unnecessary expenses. For example, most financial institutions offer optional loan payment protection in the form of credit life insurance, credit disability insurance and GAP (Guaranteed Automobile Protection). Life and disability insurance covers the cost of your loan payments in the event of a death or should you become disabled or out of work. GAP covers the difference in the amount you owe on an auto loan balance and the actual cash value of the vehicle paid by the primary insurance provider when a total loss or theft occurs. Most insurance plans can be financed into your original loan amount. These products are small expenses compared to the peace of mind you enjoy knowing you're finanhttps://www.avadiancu.com/prodserv/safe-deposit-box/cially taken care of when it comes to your loans. In addition, take time to review your homeowner's and life insurance policies each year before you automatically renew them. With Mother Nature making some pretty bold statements these past few years, it definitely doesn't hurt to review flood, sink hole and other natural disaster coverage. Make sure your life insurance plans still match up to your current lifestyle and family situation. And if your medical insurance changes and you start experiencing higher premiums with less coverage, consider a Health Savings Account (HSA) as an alternative. An HSA serves as an account you can put money into for future medical expenses and works like a checking account. You may choose a single or family program based on your individual needs. And the best part, HSAs come with tax benefits. Shameless Plug: Avadian offers Credit Life Insurance, Credit Disability Insurance, GAP and Health Savings Account. Plus, we also offer a special member-only discounted insurance program for auto, life and homeowner's insurance. To find out how we've helped our members save money, click here. From the moment you're born, you are defined by a piece of paper - your birth certificate. And it doesn't stop there...drivers' license, marriage certificate, wills, social security cards, passport, etc. All of these important documents tell who you are and where you are in your life. Even important photos tell your life's story. If these documents should get lost, stolen or damaged, it could cost you money, time and heartbreak. Make copies of these items (both hard copies and electronic if possible) and invest in a safe deposit box. By securing these items, you know where they are at all times. Scary Tip: Statistics show that in 2006, fire departments responded to 412,500 residential fires, which resulted in a direct loss of millions. $6,990,000 to be exact. (Source: National Fire Protection Association Fire Loss in the U.S. during 2006). Shameless Plug: At most financial institutions, the average cost of a Safe Deposit Box ranges from $40 to $160 per year, depending on size. At Avadian, we think you will find our rates more economical. Click here to learn more. All your preparation and protective measures will do you no good if you don't communicate them to someone. Communicate your financial affairs to your spouse or someone you trust. If you don't already have a financial advisor, you may want to consider contacting one. Your financial advisor will not only be in the know of all your financial affairs but can serve as an impartial party, especially during difficult, emotional times. You also may want to make a list of creditors you owe along with their phone numbers. That way if you should get in an accident and are physically unable to make your payment, you or someone you trust can contact them to explain the situation and request an extension. Take advantage of technology. If you don't already conduct your financial business online, now is the time to start. As an online user, you can check your account from anywhere at any time. With online bill payment and e-Statements, you can also pay your bills anywhere and enjoy an electronic record of your financial information. This comes in handy in case something happens to your home or if you become displaced or hospitalized for any reason. It's not only easier than a paper trail but a convenient backup for housing your financial portfolio. Shameless Plug: Sign up today to become an Avadian online user. Click here to learn more.